Koji Igarashi's dive into demon slaying kicks off soon. Japanese developer Inti Creates has lifted the lid on Bloodstained: Curse of the Moon at this year's BitSummit -- an annual, Kyoto-based celebration of the finest indie games. 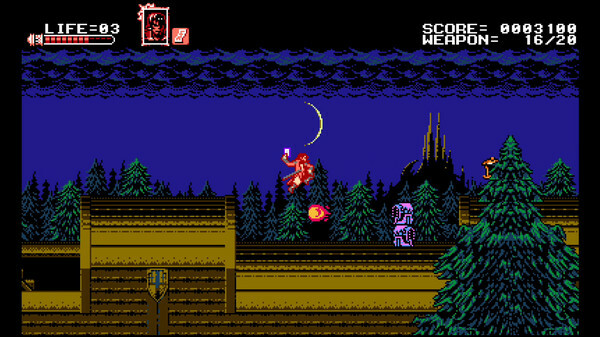 Curse of the Moon is a classic 8-bit follow-up to Bloodstained: Ritual of the Night, originally promised as a Kickstarter reward if certain stretch goals were met. Fans ensured that they were, injecting over $5 million into the project and helping it earn the title of second most-funded video game of all time. In Curse of the Moon's launch trailer, producer Koji Igarashi said that backers who pledged a particular amount should already have access to codes, which can be retrieved via the official home page or a private Kickstarter update. 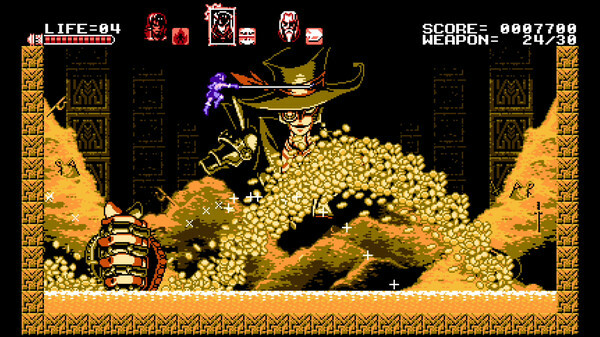 Igarashi, typically flamboyant in his cowboy hat, introduced Curse of the Moon's basic gameplay, characters, and unmistakably retro aesthetic. It feels like 1986 all over again. Players will be able to toggle between four characters on the fly: Zangetsu, a sword-wielding demon slayer, fearless whip-bearer Miriam, sly alchemist Alfred, and Gebel, a misanthrope who for some reason, has undergone crystal transplant surgery. There'll be multiple stages with a ravenous boss awaiting at the end, but once defeated, potential new allies can join your team and boost your chances of survival. Another interesting feature in Curse of the Moon is its leniency; where kicking the bucket normally would have resulted in repeating previous sections, recruited allies can now take your place. Bloodstained: Curse of the Moon is scheduled to release on May 24th for PlayStation 4, PlayStation Vita, Xbox One and PC as a digital download. The price of admission is $9.99 USD. Like Ritual of the Night -- which is expected to drop sometime in 2018 -- it'll also be heading to Nintendo Switch, but 3DS loyalists can look forward to the retro charm too.